Gigi Roggero on the Italian operaismo and the movements of the 60s and 70s. 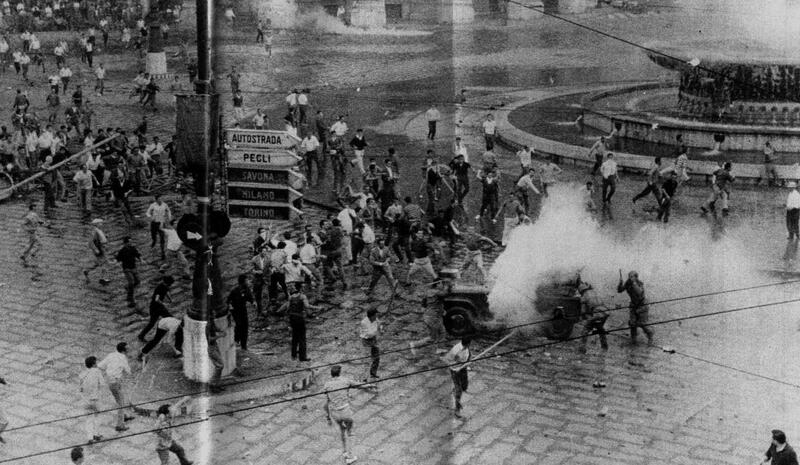 On the 7th of July 1962 the most prominent Italian city-factory, Turin, was the theater of a great workers’ revolt. That morning the Fiom-Cgil and Fim-Cisl (the two main official metalworkers’ unions, the former linked to the Italian Communist Party [Pci], the latter to the social-catholic tradition) called for a strike to support the struggles going on since June at Fiat, the most important Italian auto-factory. There was a great participation. During the afternoon the news spread quickly: Uilm-Uil (the union coming from the republican tradition) and Sida, a “yellow union,” that is, created and supported by the bosses, signed a separated agreement with the Fiat management. In a flash the metalworkers went to Piazza Statuto, a large central square of the city, where there is the office of the Uil. A long confrontation with the police started, rocks were thrown against the union windows, there was an assault to the building, and finally a riot of three days. In the end, more than 1,000 people were arrested and many injured by the special corps of police, the sadly famous celere. But the revolt of Piazza Statuto will become history very soon, as the symbol of the irruption and collective force of a new figure of labor, the mass worker, that is to say, the workers of the Taylorist factories: unskilled, embedded to the assembly line, and dedicated to a repetitive and alienating activity. The Pci and Cgil labeled immediately the rioters as thugs, delinquents, and provokers. They accused the struggling workers of being paid by the boss in order to be troublemakers against the democratic bargaining in Fiat. In fact, the thesis was they were false workers. Undoubtedly, this accusation is rooted in the historical paranoid vice of the Left that we can call dietrologia, that is, the search for ulterior and hidden motives behind political events. When there is a revolt organized directly by workers without representation, immediately the traditional Left institutions hypothesize secret causes or even dark plots and conspiracies. As the workers are supposed to be without an autonomous agency, only the party and the union can organize their struggles. But in the Piazza Statuto revolt case, there is something else. In the official communiqué of condemnation of the events, the reason raised by the Pci and Cgil to justify their accusation against the supposed provokers is particularly interesting. The main argument was the rioters were not workers because clearly they did not look like workers: their behaviors, style of clothing, or even the length of their hair were not those of the workers. And they were too young to be factory metalworkers. This is exactly the point. Beyond dietrologia, the central problem is the complete incomprehension by the traditional labor movement institutions of the powerful emergence of a new class composition, with new subjects, new behaviors, new needs and desires, and new forms of conflict. In other words, they did not understand the formation of a new collective subjectivity. Writing the communiqué, as well as operating in the factory, the party and the union were cognizant of a declining figure of the worker, proud of his or her profession and with a great cult of work. This figure does not disappear in the Taylorist factories either: but from the political standpoint, it was no longer central. Mass worker was the name of the new conflictual subject, central in the rising class composition; and it was the name of the challenge to the traditional labor movement forms of organization. The revolt of Piazza Statuto decreed the break within Quaderni rossi (“Red notebooks”), the militant journal founded in 1961 in Turin, known as the starting point of operaismo. This is the name of a revolutionary theoretical and political practice, based on the radical rereading of Marx, against the orthodox Marxist tradition.1 Since the end of the 1950s, a “militant investigation” started in many factories to inquire about the new quality of struggles and workers’ behaviors in the great processes of mass industrialization that definitely changed the Italian social and economic life. In fact, since the years of the post-Second World War the Pci abandoned the centrality of the political intervention in the factories: its strategy was to pursue the middle-classes consensus in order to build up a new national-popular party and to follow the “Italian way to socialism.” On the other hand, the idea was the irreversible integration of the working class in the capitalist system: therefore, it was no longer a revolutionary subject. When Fiom-Cgil was defeated in the union election at Fiat in 1953, this idea entered a vicious circle: the communist cadres fled the strategic intervention in the factory, weakening the official organizations of the labor movement, and the consequent defeat of the official organizations of the labor movement became the cause of the abandonment of the strategic intervention in the factories. In this framework, Quaderni rossi tried to overturn the current image of working-class alienation: therefore, young researchers and militants moved in the opposite way of the labor movement institutions, choosing to strategically aim on the new workers’ potential in the factories. At the same time, the journal sustained a strong relation with the left of the Cgil. But the revolt of Piazza Statuto was a turning point in the tension between two political souls: on the one hand, the urgency for a political experiment in revolutionary autonomous workers’ organization; on the other hand, the purpose of innovating the political and unionist culture and practice of the labor movement organizations, maybe in a strong conflict, but without breaking with them. This was the central reason of the split. Also, we could interpret the split with regard to different conceptions of the militant investigation (as a political tool). It could refer to the use of the sociological paradigms and scientific instruments, putting in question only its finalization, that is to say, directing the production of knowledge to the existing labor movement institutions in order to change them. The risk was the enforcement of the classical division between the political and intellectual spheres that is the base of the representation system. The conricerca (coresearch) aims at knocking down this separation: in this sense, the production of knowledge becomes immediately the production of subjectivity and organization. It was practiced by militant researchers and workers together, with different abilities and conditions of life but commonly wanting to strive within and against the hierarchization process of the capitalist system. In other words, the conricerca is a political praxis within the class composition, aiming at going beyond the forms of external representation and at building up a common process of self-organization. This is the central difference with regard to the traditional “workers’ enquiry.” And conricerca was the political praxis at the base of Classe operaia (“Working class”), the new journal born by the split with Quaderni rossi. We too have worked with a concept that puts capitalist development first and workers second. This is a mistake. And now we have to turn the problem on its head, reverse the polarity, and start again from the beginning: and the beginning is the class struggle of the working class. But when we say that there is a unity in the movements of the international working class—how are we to grasp it? The various institutional levels of the official labour movement only create divisions in everything; the structures of capitalism unify everything—but only in capital’s interests. An act of political struggle can’t be simply tested and measured by empirical means. The only way to prove this unity is to start organising it. In other words, this is the translation of the conricerca in a new political style and revolutionary method. The exact material characteristics of the new class composition from the 1950s to 1960s were “Planned non-cooperation, organised passivity, polemical expectations, a political refusal, and a permanent continuity of struggles”: its central political figure, the mass worker, was constituted by the migrants from the South to the North of Italy, for instance in Turin or Milan, or from the countryside to the industrial areas, as in Veneto. As the new workers were quite impervious, strangers, and sometimes against the traditional forms of labor movement organizations, Pci and the unions accused them to be passive, integrated, or even accomplices with the boss restructuration of the factories. On the contrary, the operaisti militants overturned this point of view, reading the supposed passivity or alienation as a specific form of refusal and noncooperation with the capitalist organization. The militants were motivated by refusal of work but also by refusal of the traditional forms of labor movement organizations. It was a constituent refusal, that is, the formation of a new collective antagonist subjectivity. From this standpoint, the behaviors of the mass workers were not un-political but the formation of new political practices and autonomous organization based on the breaking of the traditional representation system. At the end of July of 1969, there was in Turin the “national meeting of the workers’ committees and avant-gardes” to discuss and unify the different groups and experiences of struggles of the last years. At the beginning of that month, the 3rd of July, during the union strike, a great demonstration organized by the “Assemblea operai-studenti” (“Workers and students assembly”) started from Mirafiori and claimed the end of the workers’ house rent. Seven years after the revolt of Piazza Statuto, the metropolitan space was once again filled by the powerful workers’ resistance and the violent police aggression. The claim “we want everything!” became the symbolic proposition of the rising workers’ power. The students’ movement of 1968 and the workers’ “hot autumn” of 1969, the autonomous committees in the universities and in the factories, were unified in a common process, in Turin as well as in Porto Marghera, in Milan, in Bologna, or in Rome. That is to say, in a common process of a new class composition. This was the living body of “Potere operaio,” as a wide network of autonomous workers’ groups acting in many Italian factories. It was born by a new split within the operaismo, leading to the end of Classe operaia. On the one hand, some militants decided to join or go back to the Pci, trying to move it toward revolutionary positions. The idea was that the workers’ struggles needed the autonomy action of the party in order to destroy the capitalist system. On the other hand, the militants who built up “Potere operaio” pointed out the strategic autonomy of the class as the center of the new forms of organization and revolutionary rupture. The central topic of the workers’ struggles was the wage, as the direct expression and measure of the relations of force between the classes. “More money and less work” and “wage increases equal for all” are the two main claims, summarizing the material workers’ power on the reappropriation of the social wealth produced by living labor. At the same time, they were the direct practice of equality and liberty, that is to say, the immanence of communism in the materiality of the conflict and the class composition organization. After the concrete expression of the workers’ autonomy, there is no more space for communism as an external theory or a future state. It lives in the constituent power of living labor. During the 1970s, the Comitato operaio of Porto Marghera (as well as other Assemblee autonome) was also an important example of the beginning of a great battle against the noxiousness of the workplace. It was a workers’ environmentalism, breaking with the cult of work belonging to the socialist tradition, and radically different from the idea of the general interest supported by the civil society environmentalism. The problem was not the future destruction of the world but the present destruction of the workers’ life. Meanwhile, the centrality of the factory did not mean a reduction of the political intervention by the organizations linked to operaismo. Since the 1960s, the theoretical and practical nexus between the struggles in the factory and the struggles in the social context was clear: this allowed the Comitati operai to be central in the claims about house, transport, city costs, and forms of life. It is not accidental that a genealogical event of the upheaval cycle of the new class composition was the riot of Genova, in July 1960, against a meeting of the neo-fascist party (that supported the Italian Christian-democratic government). The young workers, joined with the Genova dockers, had a violent confrontation with the police, preventing the fascist meeting and forcing the government to resign. Similar riots happened in other cities, with a dozen of young workers killed by police. They were labeled the “young with striped t-shirts,” identifying their novel style of clothing and life. It was a picture of the new emerging collective and antagonistic subjectivity. In March of 1973 the workers occupied Fiat-Mirafiori with their “red neckerchiefs”: it is the symbolic peak of the operaio massa uprising, but it is also the turning point of the change in class composition. In fact, new and autonomous social subjects of labor were growing: first of all, the emergence of feminism, which challenged and transformed the languages and the practices of politics. There was also an operaista feminism, focusing the claim of the wage for domestic labor—mainly the group “Salario al lavoro domestico” (“Wages for housework”)—and then the social service and welfare for women. The relation with the feminist groups was often problematic: it was a partial irruption within the partiality of class that puts in question and changes its composition. And there was the emergence of the political militancy of a new young proletariat, especially in the peripheries of the metropolitan areas. It grew up in the refusal of work and in the flight from the factories: the construction of “counter-power” in the neighborhoods and in the urban spaces became a novel form of workingclass struggle and politics. After 1973 and a new split in the history of operaismo, within “Potere operaio,” “Autonomia operaia” was the new form of this emergent living labor composition. It took on different forms of organization. In Northern Italy it networked Comitati operai (as Porto Marghera one, or Assemblea autonoma of Alfa Romeo in Milan), political collectives, and the rising organized experiences of the metropolitan young proletariat. In Bologna there was a great explosion and diffusion of the social movements and the experimentation of new political lexicons and practices. In Rome it was based on the Comitati autonomi operai (“Workers’ autonomous committees”), mainly at Enel (the state electricity industry) and Policlinico, the bigger public hospital, as well as in some popular neighborhoods. The uprising of 1977 was the culminating moment of the growth of the autonomous movement as well as the peak of the irreversible clash with Pci. Overall, the autonomous movement is the genealogy of the present, that is to say, the raising of a new living labor composition—cognitive, precarious, mobile, migrant, and metropolitan. The young proletarians refused to follow their parents in the factories, and work was immediately perceived as wage slavery. The flight was the road, searching for new and immediate forms of collective and conflictual life. The focal point of the struggle was set as the “sun of the future,” used by the socialist tradition to continuously postpone and neutralize the conflicts and claims for liberty in the present. In the ambiguous blurring of the borders between life and labor, the whole society became a sort of factory, that is to say, a “social factory.”9 This is the root both of the contemporary “communism of capital” and the new battlefield: in this framework, how to transform the exodus from the “Fordist” factory into the destruction of capital and into a new social relationship based on the radical reinvention of liberty and equality is the question. Soviet and Autonomy Today: What Is to Be Done? This does not mean supporting a progressive or teleological idea of the history or thinking the irreversible expansion of rights: on the contrary, the rights are immanent and dependent on the relations of force. But this means analyzing the new context and its political problems, starting from class subjectivity and from the fact that the composition of living labor has been unrecognizably transformed by the worldwide struggles of the last four decades. Only in this way is it possible to understand the contemporary global framework not as a unilateral imposition by capital but as the new battlefield. Within this battlefield, we need to radically rethink the categories forged by operaismo in the space–time coordinates of the “Fordist” factory and based on a specific figure of the worker. First of all, we have to rethink the relation between the technical and political composition of class. At the same time, we could assume and improve its style and method, that is to say, the immanence of the theoretical practice to the class composition transformations and struggles. This is true also for the central problematic question of the experience of operaismo and Comitati autonomi: the forms of organization. In fact, the workers’ autonomy was not the simple reproposition of the traditional topics of the workers’ council movement, that is to say, the claim for a politics from below, the ingenuous faith in self-management, or the apology of class spontaneity. Instead, it was the expression of a new relation between organization and spontaneity, or the organized spontaneity. Therefore, within the workers’ autonomy and its forms of organization, operaismo was also the attempt to assume, reinvent, and transform the Leninist relation between party and soviet, that is, to construct the organized process of political direction within the relation between the technical and political composition of class. In fact, at the end of the 1960s the so-called movement of the factory councils was the response by the left part of Cgil to the workers’ insurgence and their autonomous institutions, that is to say, the attempt to capture and soften their direct exercise of power. Rethinking the operaismo theory and praxis in the thoroughly new context meant rethinking the matter of organization in the contemporary class composition, that is, global, heterogeneous, and within a process of cognitization.11 As there is no class without class struggle, this concept is not at all a sociological or economistic category: it is the insurgence of a powerful partiality, which definitely splits the abstract modern image of the people and citizen. At the same time, the class partiality is continuously put in question and changed by other partialities. Therefore, class is a line of force; along with it, there is the composition of the differences and its insurgencies. For instance, since the 1960s the race and gender insurgencies all around the world have split the class composition and reformed it in a new line of force, based on the irreducibility of the singularities. Actually, the transformation in the political class composition comes out from a struggle between singularities and subjects of the living labor. In a similar way, the split in the operaismo history (even in its organization) is always related to a constituent process. Nowadays, in the new space–time of global capital and class composition, in the partial autonomy of the living labor cooperation with regard to the capitalistic organization, the matter is to rethink the workers’ soviet of the 1960s and 1970s immediately in a constituent dimension: the construction of the institutions of the common,12 that is to say, the organization of autonomy and resistance of living labor/knowledge, the power to determine command and direction collectively within social cooperation and produce common norms in breaking the capitalist machine of capture. The institutions of the common are the organizational force of the collective appropriation of what is produced by all of us: the social wealth. Thus, institutions of the common are not only beyond the party and union forms and the representation system, but they are immediately soviet and political in direction. According to Marx the proletariat had thus avoided engaging in an insurrection that would have reinforced the bourgeoisie and reconciled it with the army, inevitably leading to a second defeat for the workers. Similar to the ways in which the operaisti of the 1950s and 1960s found the potential of resistance within the so-called “alienation” and “integration” of what would become the mass worker, we have to find the possible lines of reversibility in the apparent passivity of the contemporary subjects of living labor. To focalize and act these possible lines of reversibility, we have to reinvent the coresearch immediately as a constituent practice. To rephrase Tronti, we could say there is no organization without coresearch. Forty years after the Piazza Statuto event, an interviewer asked Romano Alquati if they expected the workers’ revolt, and he replied: “We didn’t expect the revolt, but we’ve organized it.” The truth of co-research, as well as the class organization, is definitely here. Gigi Roggero has a PhD in the Sociology of Labor at the University of Calabria and is currently a postdoctoral researcher in the Department of Politics, Institutions, and History at the University of Bologna. He is on the editorial board of the transnational edu-factory project and the Uninomade collective, and a regular contributor to Il Manifesto. He is the coauthor of Futuro anteriore (2002), Precariopoli (2005), and Gli operaisti (2005) and the author of Intelligenze fugitive(2005), L’archivio postcoloniale (2008), and La produzione del sapere vivo (2009). 1. About operaismo see Borio, G., Pozzi, F. and Roggero, G. (2002), Futuro anteriore. Dai «Quaderni rossi» ai movimenti globali: ricchezze e limiti dell’operaismo italiano, Roma: DeriveApprodi; Borio, G., Pozzi, F. and Roggero, G. (Eds.) (2005), Gli operaisti, Roma: DeriveApprodi;Wright, R. (2002), Storming Heaven. Class Composition and Struggle in Italian Autonomist Marxism, London: Pluto Press; Trotta, G. and Milana, F. (2008) (Eds. ), L’operaismo degli anni Sessanta. Dai «Quaderni rossi» a «Classe operaia», Roma: DeriveApprodi; Mezzadra, S. (2009), Italy, Operaism and Post-Operaism, in Ness, I. (Ed. ), International Encyclopedia of Revolution and Protest, Oxford: Blackwell Publishing, 1841–5. 2. Tronti, M. (1971), Operai e capitale, Torino: Einaudi (2nd enlarged ed., 1st ed. 1966), 89. 5. Tronti, M. (2008), Classe[, in Various Authors, Lessico Marxiano, Roma: Manifesto libri, 65–76. 6. See Alquati, R. (1975), Sulla Fiat et al. tri scritti, Milano: Feltrinelli. 7. See Sacchetto, D. and Sbrogiò, G. (Eds.) (2009), Quando il potere è operaio, Roma: Manifestolibri. 8. Negri, A. (2009), Un intellettuale tra gli operai, in Sacchetto, D. and Sbrogiò, G. (Eds.) (2009), Quando il potere è operaio, cit. 9. Negri, A. (1979), Dall’operaio massa all’operaio sociale. Intervista sull’operaismo, Milano: Multhipla Edizioni. 10. Hardt, M. and Negri, A. (2000), Empire, Cambridge, MA: Harvard University Press. 11. About cognitization of capital and labor see Vercellone, C. (Ed.) (2006), Capitalismo cognitivo. Conoscenza e finanza nell’epoca postfordista, Roma: Manifestolibri; Roggero, G. (2009), La produzione del sapere vivo. Crisi dell’università e trasformazione del lavoro tra le due sponde dell’Atlantico, Verona: ombre corte. 12. See Hardt, M. andNegri, A. (2009), Commonwealth, Cambridge, MA: Belknap Press of Harvard University Press. 13. Marx, K. and Engels, F. (1950), Carteggio Marx-Engels, Vol. 1, Trans. M. A. Manacorda, Roma: Edizioni Rinascita, 343. This political gamble might appear too unrealistic for those who in the last 3 decades have talked incessantly about the passivity of the new subjects. In the aftermath of the global movement and the onset of the global economic crisis, this assessment no longer makes sense: neoliberalism is over.